Travelers wanting to live Henry David Thoreau’s transcendentalist visions will not find them in Dubai, a city known for extravagance in every way. 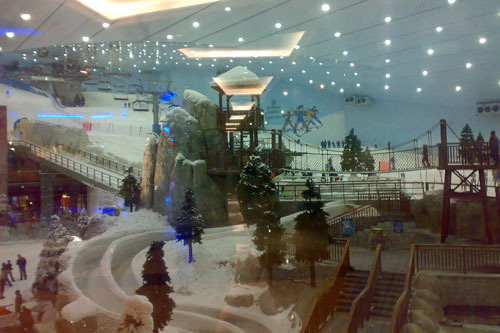 Dubai is home to an indoor ski resort, the world’s only 7-star hotel, and the world’s largest mall. Its airline, Emirates, features gold-plated seats and on-board showers. If you are looking for a way to get in touch with your inner hedonist, then a trip to Dubai is a must. Dine underwater at the exclusive Burj al-Arab Hotel, take a helicopter tour of the surrounding islands, and shop till you drop at the Mall of the Emirates. For an age-old tradition, go for the Falconry Experience in the Arabian Desert. Recently snubbed in favour of the even-more ridiculously colossal Dubai Mall, this sprawling homage to Mammon still has many delights. For one, the glorious Kempinski Hotel is anchored on to the side, and in what must have been the architect’s worst nightmare, a ski run is grafted on to the top. 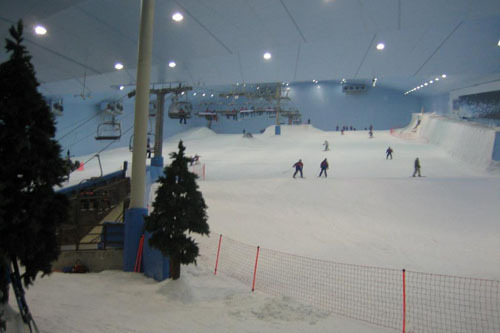 Yes it looks bizarre but this is (not surprisingly) the only ski resort in the Emirates. Western tourists gather in the Après Bar overlooking the slopes to watch men in white dishdashas swooping down through the snow. Harvey Nichols has its flagship UAE store here, where the highlight is the delicious Middle Eastern food served at its restaurant. 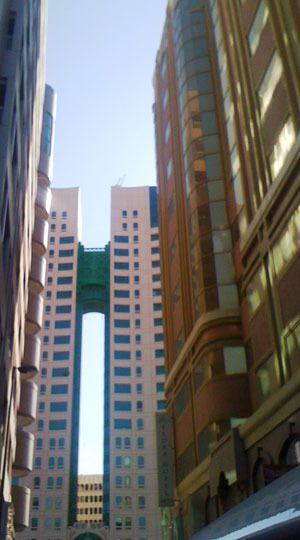 Other facilities include an Arabian shopping area on the top floor, perfect for buying quality lamps, glassware, and other souvenirs from Al Jaber, and designer labels plus computers and electronics on the first level. There are two fast-food courts, numerous licensed restaurants, a 14-screen cinema, and the entertainments complex Magic Planet for kids. Complimentary shuttle buses operate from most nearby hotels. Hastily renamed in 2010 after the ruler of Abu Dhabi was obliged to help Dubai out of a financial crisis, the beautiful bronze-and-glass Burj Khalifa is currently the world’s tallest building at 828 meters, and also holds the record for the world’s highest observation deck at 124 stories up. Prebook tickets in the lower ground floor of the adjoining Dubai Mall for a trip to the top of the, designed by Chicago firm Skidmore, Owings & Merrill LLP. 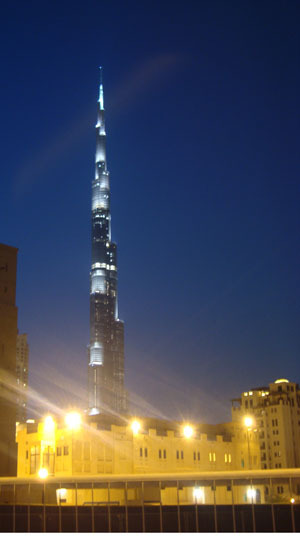 The travelator and elevator trip is augmented by a documentary on the history of Dubai; when you arrive at the glossy At The Top observation deck, prepare for a moment of disbelief as you see Dubai, the Gulf, and the desert laid out far, far below. Book your trip to the top at sundown to see the streaming lights of Sheikh Zayed Road, the changing floodlighting on the Burj Al Arab, and planes taking off from the airport. Time your trip correctly and you’ll get a bird’s-eye view of the dancing fountains in the lake next to the tower. If you fancy staying in style, the luxurious Armani Hotel occupies the first eight floors of the tower and levels 38 and 39. Experience the novelty of skiing in the desert in conditions comparable to those with ‘real snow’. Ticket includes jackets and trousers, ski or snowboard boots, skis and poles or snowboard. Helmets are available for small children. Hats and gloves can be purchased from the retail shop within Ski Dubai. Ski and snowboarding lessons can be booked in advance for individuals or groups. Freestyle nights are held fortnightly from 20:00 and feature a DJ along with the opening of the snowboard park. The snow park is home to a bobsled ride and toboganning hills, catering for children and parents who wish to accompany them. Lockers are available for rental. See Dubai’s flamboyant sights from the air on a 15- or 25-minute helicopter flight over the city! Aboard a 5-seater helicopter with clear glass sides, glide above the man-made archipelagos of Palm Jumeirah and The World, and loop around the cloud-reaching skyscrapers for which the city is famous. See the luxurious Burj Al-Arab hotel as well as Burj Khalifa, one of the world’s tallest — and most impressive — buildings. Start your experience with pick up from your hotel, you will arrive at the Atlantis at Palm Jumeirah at least 45 minutes before your chosen flight time. Check in, and then take a seat in the spacious lounge to listen to a comprehensive safety briefing. Help yourself to a soda or hot drink (own expense), and then leave any personal items in your locker; only cameras are allowed on the flight. At your start time, follow your pilot to the helipad and then relax in your seat (either beside the pilot or in a row of four seats to the rear) as you take to the skies above Dubai. With iconic Palm Jumeirah and the sea to one side, gaze out over the city as you soar around the sleek high-rise buildings and swanky malls that embody Dubai’s urban skyscape. Cruise above downtown Dubai and marvel at Burj Khalifa, one of the world’s tallest man-made buildings, with its pin-sharp tower. Glance down at the luxury sail-shaped Burj Al-Arab hotel, and ogle the sandy beaches that frame the city’s bustling streets. Your pilot will point out attractions as you pass them to ensure no sights are missed! Before returning to the start point at Palm Jumeirah, soar around The World, one of Dubai’s most ambitious property projects, where nearly 300 man-made islands have been built to look like the continents of the world. Admire Greenland, which was bought by a sheik as an exclusive vacation home, and hear stories about Lebanon, a ‘country’ owned by a private hotel. After 15 minutes in the air, loop back to Atlantis at Palm Jumeirah and touch down at the start point where your helicopter experience finishes with drop off back at your hotel. If you have more time free, upgrade to a 25-minute flight and spend longer in the air, checking out all the city’s attractions. This interactive wildlife experience introduces you to the vast Arabian Desert, Dubai’s native animals and the UAE’s ancient tradition of falconry. Learn about the history of falconry, a practice that uses trained falcons to hunt prey, and discover why it's so important in Arab culture. You’ll get to interact with the falcons and try your hand at Falconry yourself! Then, spot wildlife such as Arabian Orxy and Gazelle from the comfort of a luxury Range Rover or enjoy an open-roof vintage Land Rover, a mode of transport used extensively in 1950’s desert expeditions on a tour of the Dubai Desert Conservation Reserve, the most carefully preserved wildlife area in the UAE, followed by a camel ride through the desert. This small-group tour is limited to 16 people, ensuring you’ll receive personalized attention from your guide. You’ll be picked up from your Dubai hotel in the morning and taken to the grounds of a local royal family members desert retreat for your interactive falconry experience. During the demonstration, you’ll learn all about the ancient practice of falconry, in which trained falcons are used to hunt prey such as hares and various types of birds. This centuries-old hunting tradition is an integral part of desert life and an important part of Arab heritage and culture. In fact, The UAE reportedly spends more than 27 million dollars each year towards the protection and conservation of wild falcons! Your guide will go over both ancient and modern training techniques, and explain the history of falconry, which was originally used to supplement the Bedouin diet with meat (Bedouin refers to the Arab nomadic tribes of the Arabian, Syrian, Nubian, and Sahara deserts). You’ll then get to observe the world’s best-trained falcons and even try your hand at swinging the lure or flying a falcon yourself! After your falconry experience, take a guided tour of the Dubai Desert Conversation Reserve, the most carefully preserved wildlife area in the UAE and Dubai’s first national park. Travel through this vast wildlife reserve in the comfort of a luxury Range Rover or your open-roof vintage Land Rover, keeping an eye out for animals such as Orxy, Gazelles and many other native desert flora and fauna. When you return to the camp, enjoy a freshly prepared local snack such as chabab (Arabic pancakes) or Ragaag (Fresh Arabic bread). If you wish, you can also ride a camel through the desert! Afterwards, you’ll be taken back to your Dubai hotel, located about an hour away. A portion of ticket sales goes towards local animal conversation, so you can feel extra good about participating in this Dubai wildlife experience.